The Princesses! Jaime Ann: The Princesses! We stayed in Sarasota which is about 2 hours south of Orlando. 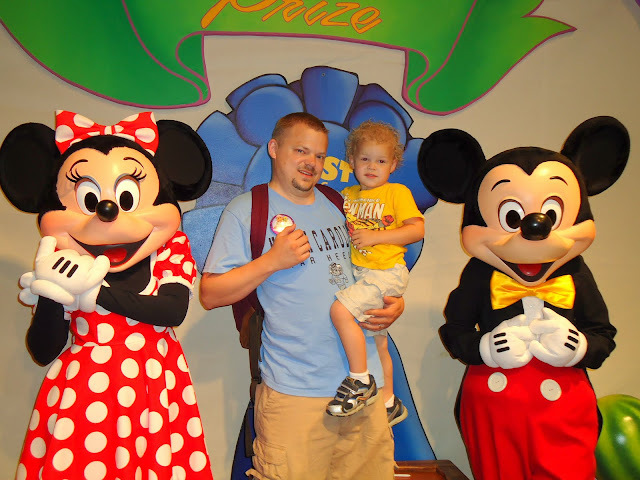 However, we decided that we couldn't go to Florida without taking the kids to Disney World. Bill and I signed up for Disney's "Give a Day Get a Day" program. We volunteered a Saturday at a resale shop and each got a free ticket to a Disney theme park. Liam was free because he was under three, so it was not a very expensive day (minus paying obscene amounts of money for hotdogs and water). My mom came with us--she almost wasn't able to because she wasn't feeling well, but thankfully she rallied because she didn't want to miss the kids' first trip to Disney! 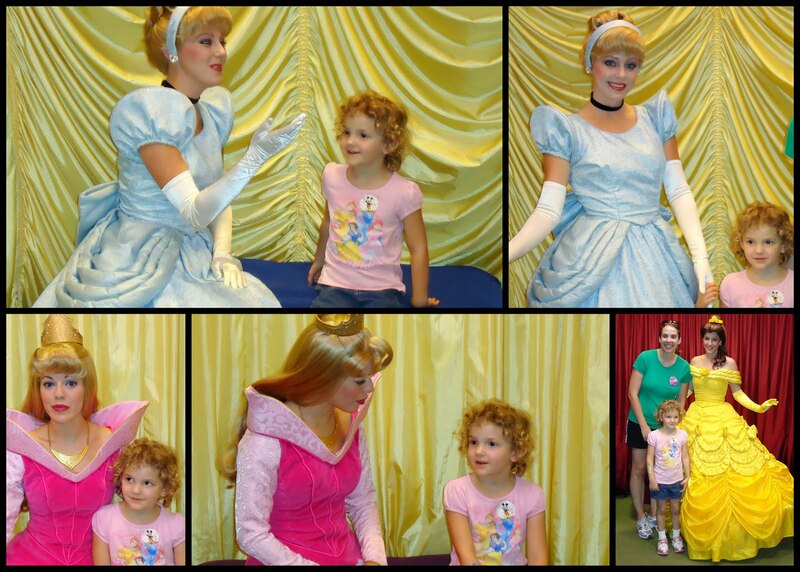 I had one wish and one wish only for our trip to Disney; that was for Rori to at least see a princess. I knew that the only guaranteed way to meet a princess at the Magic Kingdom was to dine at Cinderella's Table restaurant. You have to make reservations 6 months in advance. We did not do that, so we couldn't get in. However, right about the time we arrived at the Magic Kingdom a show was starting at Cinderella's Castle. I was worried that Minnie and Mickey were going to be the only ones in the show, but out came Cinderella, Sleeping Beauty, and Snow White! I don't know who was more excited--Rori or me! Being the cheese that I am, I teared up a bit because I was sooooo happy that Rori got to see them--even if they were on stage and not right up close. The kids rode a bunch of rides and had a blast. Bill, my mom, and I melted into puddles of sweat, but thoroughly enjoyed seeing their faces. I saw on the map that there was a character greet area so we headed over there in the hopes of seeing at least one princess. We got there and I asked if the princesses were there and the lady told me there were some inside. I was worried we'd be waiting hours in line, so Bill and Liam went off to meet Mickey and Minnie. We only ended up waiting about twenty minutes and Rori got to meet three princesses!! Each one took some time to talk with her and give her a hug. Rori was in heaven, as was her mommy and grandma. They were each so sweet to her and it made the whole trek to Disney worth it! Liam got to meet Mickey and Minnie Mouse and he was almost as thrilled. Not as thrilled as if he had gotten to meet Batman, though! By the end of the day, everyone was exhausted, but satisfied! Notice Liam's sweaty head (although it's mixed with obscene amounts of sunscreen that Bill sprayed on his head)!! How fun!!! Glad your mom was able to go with and that Rori was able to see all the princesses and Cinderella's castle! Whew! Looks like it was a warm day! Awww! 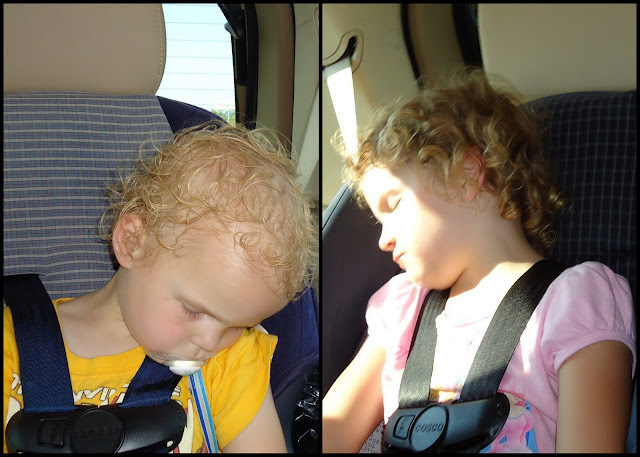 Love the sleeping pictures! It was a day to remember! I wouldn't have missed it for the world. Thanks for letting me come and Bill, for getting gas. Welcome to the family Marylou!